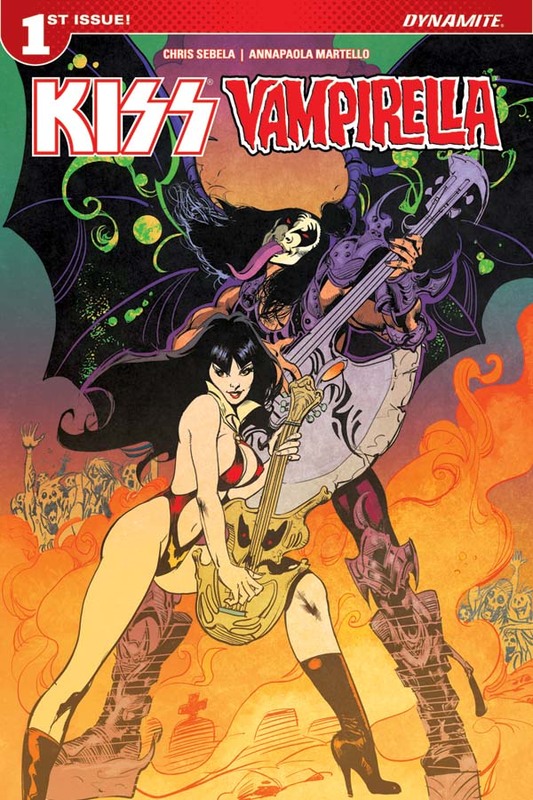 Stars and Starchild align… Kiss / Vampirella Crossover! 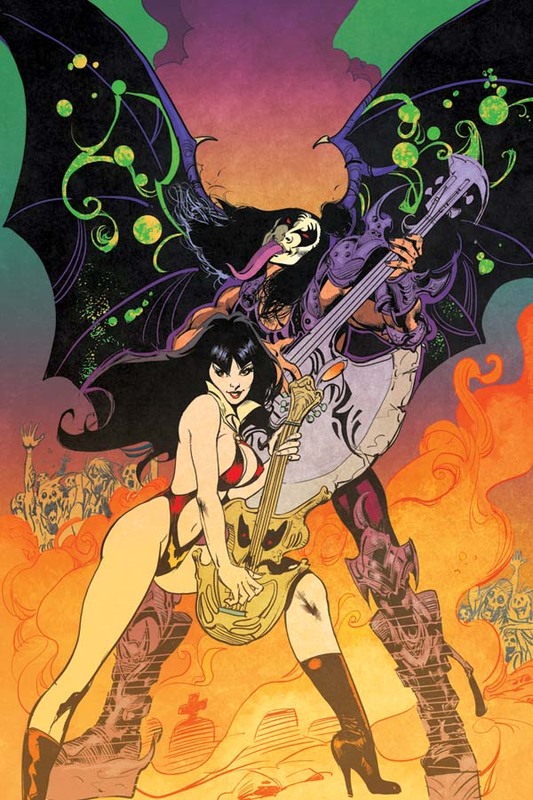 Dynamite Entertainment proudly brings together two of its bestselling brands for a horror/music extravaganza in KISS/Vampirella #1, the debut issue in a new comic book series uniting the legendary rock ‘n’ roll ban with the comic industry’s iconic mistress of the macabre! Written by Chris Sebela (Captain Marvel, Alien vs. Predator) and illustrated by Annapaola Martello (Scarlet Witch, Spider-Gwen), KISS/Vampirella will be a miniseries event launching in June 2017. Los Angeles is a strange town on the best of days, but in the summer of 1974, the City of Angels feels especially demonic. As temperatures soar and wildfires burn, all sorts of strange creatures are drawn to town… including Vampirella. 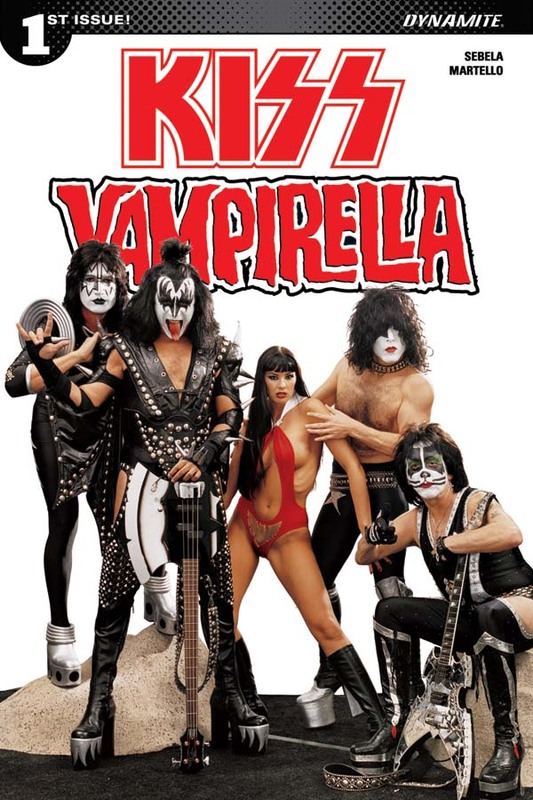 While Vampi goes out and hunts down monsters all across La La Land – defending humanity from evil – she’s also killing it every night on stage as a member of an all-girl rock group – defending rock ‘n’ roll from a dying scene. Help arrives in the form of four creatures who’ve just flown into town: The Starchild, The Demon, The Spaceman, and The Catman. 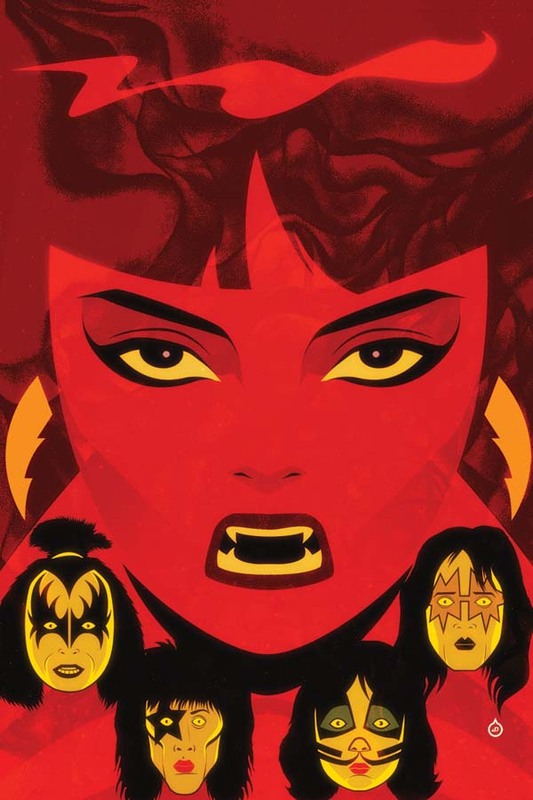 Away from their home turf and trying to record their new album, KISS discovers that all their favorite L.A. bands have mysteriously broken up, disappeared, sold out, or gone crazy. 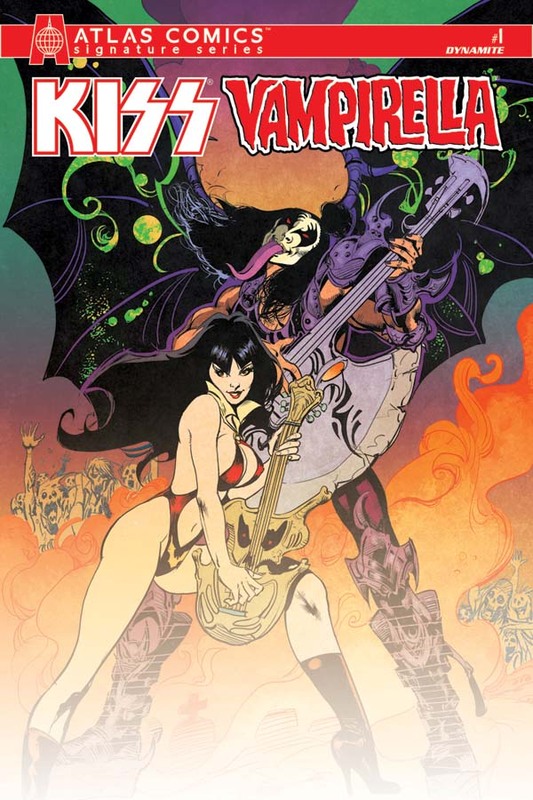 Led by a driver who moonlights in the occult and haunted by satanic strangers dressed in black, KISS finds themselves drawn into a web of conspiracy that threatens to kill rock ‘n’ roll itself! The debut issue of KISS/Vampirella features a wide selection of cover variants, providing fans and retailers with the freedom of choice! Three art covers feature the talents of Juan Doe (cover artist of Dynamite’s bestselling KISS #1 launch), Carli Idhe (Womanthology: Space), and Roberto Castro (Lords of the Jungle), respectively. 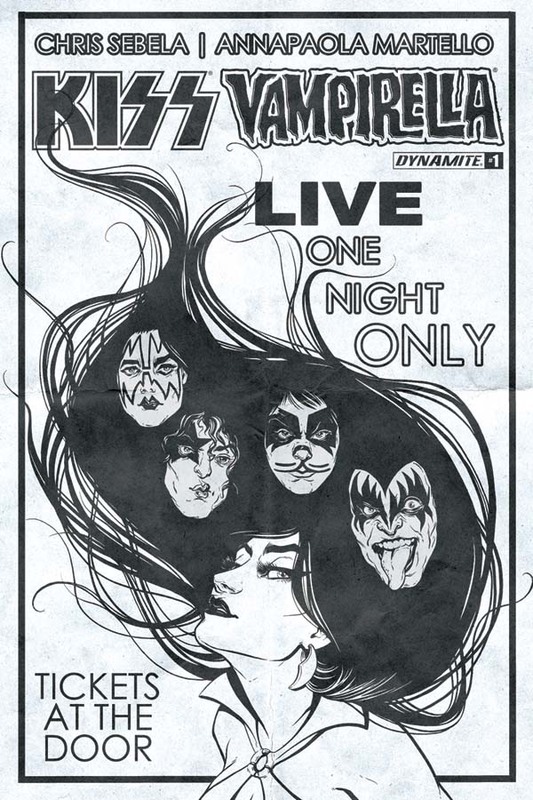 Dynamite also offers a Photo edition cover featuring KISS posing with a Vampirella model, a Cosplay edition, and a Blank Authentix edition for fans to illustrate themselves (or, for convention-goers, to commission their favorite artists to illustrate). Five limited variant editions in “Black & White” and “Virgin Art” formats are also available as retailer incentives for comic shops that support the launch issue by achieving stocking thresholds. As America’s #1 Gold Record Award winning group of all time (and that’s in every category), KISS can easily be named one of rock’s most influential bands. The Rock N Roll Hall of Famers have released 44 albums and sold more than 100 million albums worldwide. 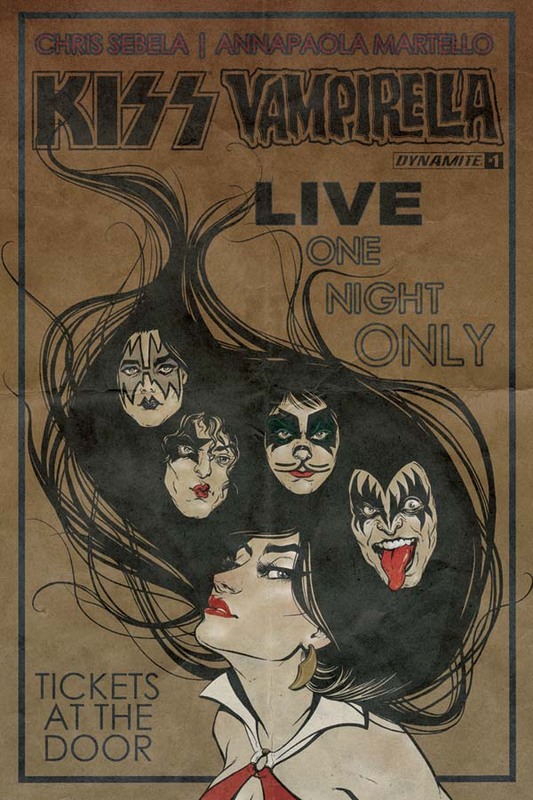 The origins of KISS comic books date almost as far back as the inception as the band itself, having been an integral part of comics culture since their 1977 appearance in Howard the Duck #12 and 1978’s Marvel Comics Super Special: Kiss. 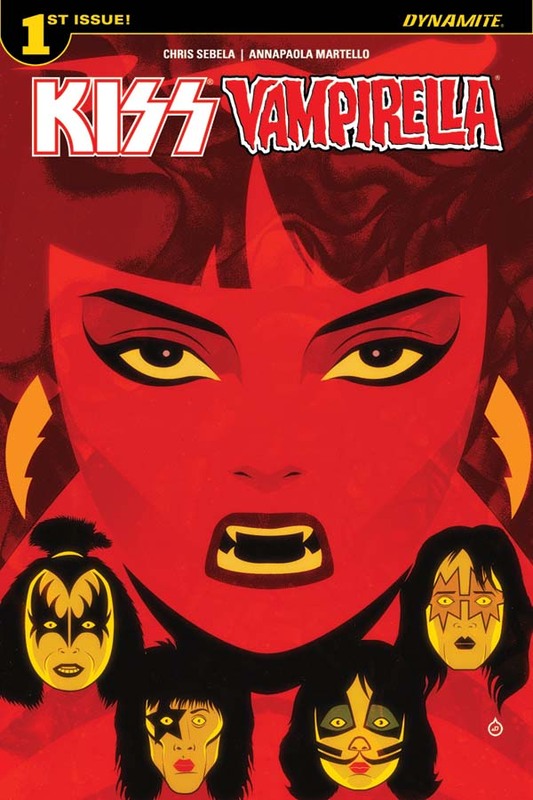 Today, nearly 40 years later, Dynamite Entertainment is the proud home to the comic book series KISS, KISS: The Demon, and now KISS/Vampirella. Vampirella is a raven-haired heroine who remains, even after 45 years of publication, one of the comic industry’s most well known characters, due in no small part to Dynamite Entertainment. Since Vampirella’s very healthy resurgence in 2010, Dynamite has published three volumes of a monthly series, several miniseries and one-shot specials, and crossovers with multimedia brands and comic book peers. The Vampirella franchise is a haven for writers and artists with a penchant for the macabre. 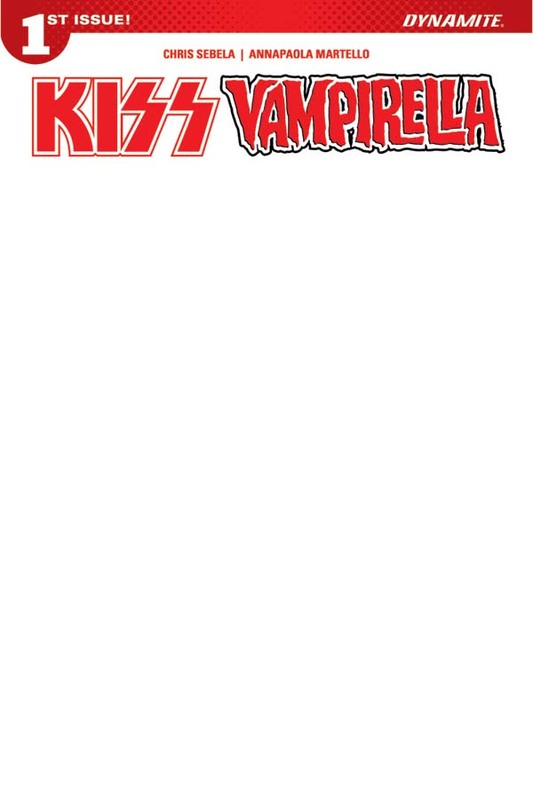 KISS/Vampirella #1 will be solicited in Diamond Comic Distributors’ April 2017 Previews catalog, the premier source of merchandise for the comic book specialty market, and slated for release in June. Comic book fans are encouraged to reserve copies with their local comic book retailers. 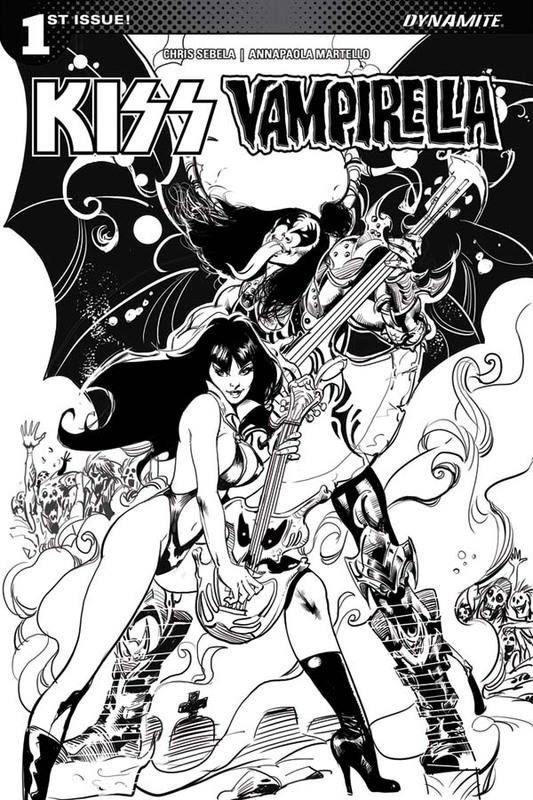 KISS/Vampirella will also be available for individual customer purchase through digital platforms courtesy of Comixology, Dynamite Digital, iVerse, and Dark Horse Digital.